Adam Wormann started us off last Monday and Tim Schmoyer followed with his post yesterday. Today Jonathan McKee chimes in, Mark Riddle shares his thoughts on Thursday, and Tony Myles wraps up the series on Friday. When I was a kid, my attention span was as short as they come. Before ADHD was a household term, there was “Jonathan.” My reputation wasn’t good. Half my Sunday school teachers wanted to pump me full of Ritalin, the other half wanted to pump me full of cyanide. I couldn’t concentrate and wouldn’t shut up. Ask me to read my Bible? Booooooooooooring! I could blame chemical imbalance, but a lot of it was a lack of discipline for me. When I would sit down to read… uh… I’m sorry… what was I saying? Sadly, this affected my relationship with God. I loved dialoguing with people about God. I loved listening to stories about God. As I learned about the 12 guys that actually got to hang around and talk with the person of Jesus, that excited me. I thought, I’d love to do that. I’d love to just sit with Jesus, walk with him, watch him, and learn from him. Seriously? Read?!! That’s all you got? For those of you academics who read Dickens and Conrad for fun, or enjoy dissecting the theology of Tozer just for kicks, maybe you won’t understand this. But I really struggled forcing myself to just sit down and read. I liked fiction as a kid. I enjoyed Twain, Hemmingway, even Dostoyevsky, but not half as much as I liked Spielberg, Lucas and Hitchcock. So when it came to the Bible, I liked Geneses, and Exodus was okay, but every time I got to Leviticus, I bailed! I could handle the Gospels and Acts, but come Romans, I wonder what’s on TV? I meet kids all the time that struggle picking up the Bible… just for fun. Sadly, they really miss out on getting to know Jesus better. 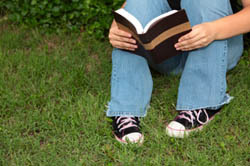 In my 20-years of youth ministry, 18-years as a father, and 41 years as a hyperactive, unmedicated individual, I’ve observed three motivating factors that have actually influenced me and others like me to dig into God’s Word. Earlier this year my daughter Alyssa had an opportunity to share with her friend. A casual conversation about life segued into a serious conversation where her friend finally asked Alyssa about her faith. Alyssa confessed to me later that day that she really didn’t know what to say. She talked about her love for God, her relationship with Him, and how she put her trust in Jesus, but really, the more she shared, the more she realized that she didn’t have a lot of the answers that her friend was looking for. Something happened. Alyssa was motivated to study God’s Word like I’ve never seen before. Now she had me reading my Bible more! Alyssa’s ongoing dialogue with a few of her friends drove her, not only to study the scriptures, but to seek wisdom from spiritual mentors in her life—people like her youth pastor, her grandpa, her mother and I. As I write this, Alyssa is reading Lee Strobel’s insightful book, A Case for Faith. She started with Josh McDowell’s book, Answers to Tough Questions, and then picked up the student version of A Case for Faith. Now she’s reading the full version. Acts 2 is a pretty exciting passage of the Bible. A huge crowd gathers, tongues of fire appear and then people starting speaking in different languages. Thousands were saved that day and were eager to grow closer to Jesus. Acts 2:42 summarizes what these people “devoted themselves” to doing every day. Did you catch the second one? Because the second one is a huge help to accomplishing the first one. Don’t underestimate the power of “fellowship.” It works like this. Young people are searching for a place where they belong, where people know their name, a place where if they go missing—they are missed. God created us with this desire for relationships. (That’s why most of the Bible is about our relationship with God and our relationship with others. It often uses other words to talk about these two categories, words like “righteousness,” doing right by God, and “justice” doing right by others.) And God’s people can provide encouragement and accountability to stay in God’s word. My junior year of high school I started meeting weekly with a mentor and we began to go through the book of I Corinthians. Each week we got together at a restaurant and talked about a chapter of this letter from the Apostle Paul. Had I not had these meetings, I probably wouldn’t have been in my Bible as much as I was. But thanks to the accountability and encouragement from this mentor, I actually looked forward to reading and studying I Corinthians so I could talk about it with him the next Tuesday night. Bible studies, discipleship meetings, accountability groups… these are all great ways to encourage young people to keep reading and learning together. We aren’t limited to just reading words off of a page in the 21st century. We can listen to words and listen to amazing teaching from people around the world. Just as people gathered in the synagogues and the temple to hear teaching 2,000 years ago, people can put the little white headphones in their ears today and have access to libraries of Biblical teaching. I have to admit, I have grown a lot through podcasts. Some of my favorites are Tim Keller’s and Andy Stanley’s podcasts. Those guys can preach the Word. But what about young people? Are there some good podcasts available for them? This podcast has one goal: To let young people taste and see that the Lord is good. We want them to experience the truth of the scriptures and begin to dig in by themselves. We actually give a reading assignment and a challenge at the end of almost every podcast so they’ll be able to read by themselves and apply what they learned throughout that week. It’s amazing to think that iTunes has so many ministry opportunities. Short attention spans, busyness or just a lack of desire, these are all common excuses that I use to not read my Bible. Evangelism, Encouragement and my set of little white Earphones have all helped me dig into the word. QUESTION: What has helped you dig into God’s Word personally?